Last year in Arlington (yes, everyone calls it Dallas but technically we are in Arlington) we actually had snow here in April. Snow! No fooling! But today temperatures reached the 80s very quickly, and in fact it’s so nice that they’ll have to keep the retractable roof closed to keep the air conditioning in. You can leave the heat off. 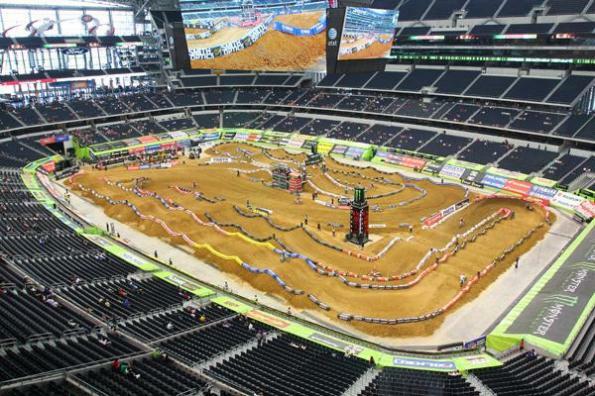 Dallas, er, Arlington, oh sorry, Irving (where the race used to be) has always featured hard, slick dirt. Moving to the new building last year didn’t change that. After just a free practice session, the track has already formed a blue groove in spots. This stadium floor is big and the track doesn’t look as tight as some of the previous rounds. There’s one very long rhythm lane that no one has quite mastered yet, but the timed practices are coming soon. The track features deep two whoop sections, and with that hard, slick dirt there’s no room for error. Wheel spin is a possibility, and a lot of the privateer riders were struggling big time in the first free practice. A couple of riders are back from injury, Kyle Regal and Tommy Hahn, but Hahn already went down in the first practice and had to take a ride in the Asterisk Mule. Hopefully he will be back for the timed practices. Ivan Tedesco’s knee is hurting bad after a crash last week, but he’s taped up and toughing it out. Blake Wharton, as previously mentioned, is due for shoulder surgery but is going to give it a go tonight. And Ryan Villopoto’s trainer Aldon Baker says RV is 100 percent, he took a hard hit in Jacksonville but was okay, and last week’s crash didn’t hurt him. The rest of the contenders are here and ready, too: Reed, Dungey, Stewart and Canard. Timed practices about to get started. Stay tuned.